MDT invites to a cinema breakfast at Bio Rio, showing “Feelings Are Facts: The Life of Yvonne Rainer”, while you enjoy breakfast. ‘Yvonne Rainer has been overthrowing genres and radically altering the way we experience dance, film, and performance art for 50 years. “Feelings Are Facts” examines the contradictions and creativity of this remarkable provocateur—still performing at age 80— and raises the question, What does it mean to be an avant-garde artist today? “The function of art is to shake us out of our complacency and comfort,” says Yvonne Rainer, whose avant-garde performances and films have agitated audiences for 50 years. Since co-founding New York’s influential Judson Dance Theater, Rainer’s boundary-crossing art has been labeled in many ways: feminist, conceptual, post-modern, political. Feelings Are Facts examines the contradictions and creativity of this remarkable provocateur—still performing at age 80—and raises the question, What does is mean to be an avant-garde artist today? Yvonne Rainer exploded onto the performance scene in the early 1960’s, a protégé of John Cage and Merce Cunningham, boldly pursuing a minimalist aesthetic, using everyday, often random movements that confounded critics. At Judson, she collaborated with the rule-breaking artists of her generation: Robert Rauschenberg, Trisha Brown, Steve Paxton, Lucinda Childs, and Meredith Monk. With foundational works like “Trio A,” Rainer radically altered the vocabulary of modern dance forever. Inhabiting the worlds of broadcast television, film festivals and art museums, Jack Walsh’s films incite, probe, challenge and inform viewers on topics ranging from cultural icons to social justice to sexual identity. Working in both the experimental film and documentary film genres, over the course of his career Jack directed nine films: Feelings Are Facts: The Life of Yvonne Rainer, 2015; The Lost Generation, 2004; The Second Coming, 1995; Dear Rock, 1993; Present Tense, 1987; Working Class Chronicle, 1985; Document Unearthed…, 1984; Basic Training, 1984; and Beachwalk, 1983. Jack’s producing and executive producing credits include Screaming Queens: The Riot at Compton’s Cafeteria, 2005; Girl Trouble, 2004; Hope along the Wind: The Life of Harry Hay, 2001; And then One Night: The Making of Dead Man Walking, 2001; the PBS series Independent View, 2000-2001; and The Amazing Voyage of Gustave Flaubert and Raymond Roussel, 1986. His films received worldwide screenings at film festivals as well as national broadcasts on public and cable television. Additionally, Jack’s works screened at the Museum of Modern Art, NY, Artists Space, Hallwalls, LACE (Los Angeles Contemporary Exhibitions), Pacific Film Archive and Yerba Buena Center for the Arts. Among Jack’s distinctions are the Documentary Jury Prize, Athens International Film and Video Festival (2005); National Emmy Award nomination (2003); two Northern California Emmy Awards (2002, 2006); three Golden Gate Awards, San Francisco International Film Festival (1986, 1988, 2002); a Grand Prize (1988), two Director’s Citations (2005, 1986), and a Juror’s Citation (1993) Black Maria Film and Video Festival. His film “Present Tense” is part of the permanent collection of the Museum of Modern Art, NY, and his productions received support from The Andy Warhol Foundation for the Visual Arts, National Endowment for the Arts, Jerome Foundation, Frameline, The Pacific Pioneer Fund, San Francisco Arts Commission, and Independent Television Service (ITVS), among others. In additional to being an artist, Jack possesses a life-long commitment to independent media and supporting the organizations that work on behalf of independent film and video makers, and to mentoring the next generation of artists and nonprofit leaders. After completing film school at San Francisco State University, he worked for maverick independent filmmaker Peter Adair before taking the position as executive director of the legendary Collective for Living Cinema in New York. Returning to the Bay Area in the 90s, Jack became series producer of the innovative public television series Living Room Festival, worked as an executive producer at public television station KQED, and most recently was executive director of the media arts service organization National Alliance for Media Arts and Culture (NAMAC). Jack has taught at The City College of New York, California College of the Arts, San Francisco State University, and University of California, San Diego. He holds a B.A. from Temple University and an M.A. from San Francisco State University. 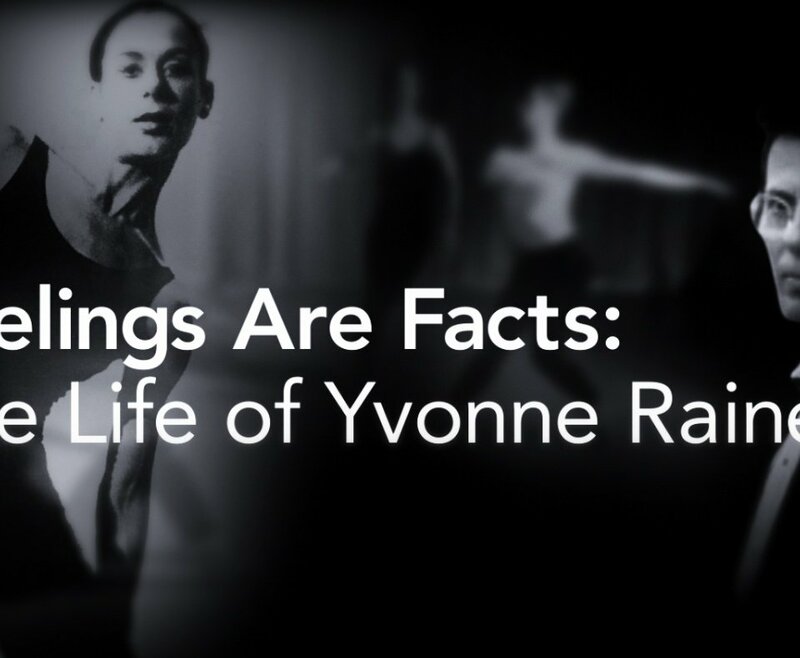 “Feelings Are Facts: The Life of Yvonne Rainer”, Jack’s most recent film and his documentary directorial debut, premiered in the Documentary Panorama at the Berlin International Film Festival, 2015. In April of this year, the John Simon Guggenheim Foundation awarded Jack a fellowship in filmmaking. Writer and Director: Jack Walsh. Producers: Christine Murray, Jack Walsh. Director of Photography: Marsha Kahm. Editors: Laurie Lezin-Schmidt, Bill Weber.